It was bound to happen sooner or later. 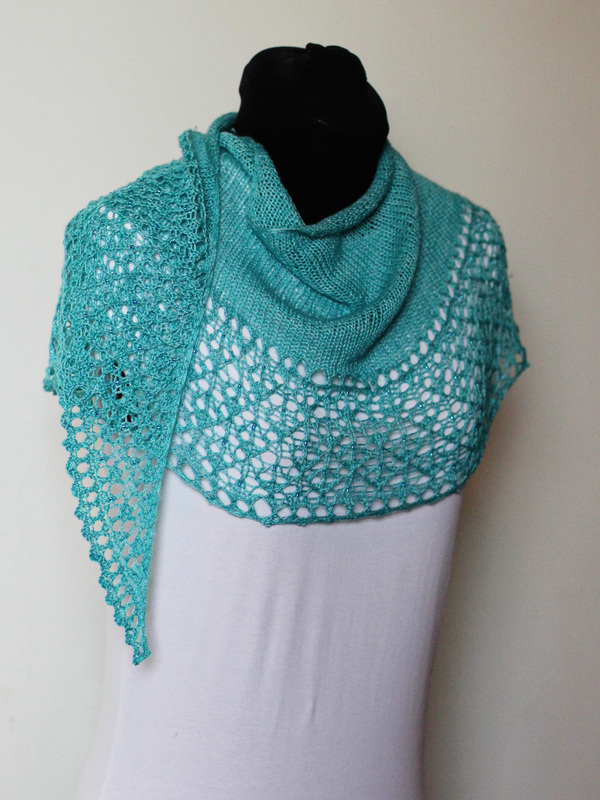 I’ve had a good streak of being satisfied with small projects and I was super excited when I saw Puaka by Aroha Knits. Right away I was very drawn to the texture of the body of the shawl and the border was just lacy enough to be interesting without being too fussy. I thought this could be a very nice gift shawl for a colleague and be an interesting knit to boot. The fabric did knit up beautifully in Tosh Merino Light and I think the Moonstone colourway is perfectly suited to the project. My gauge was just a little on the tight side but I wasn’t too worried. I realized pretty soon after beginning that the shape was a little odd. The shawl had almost a point at the center top. I soldiered on despite concern thinking perhaps it would block into a crescent. 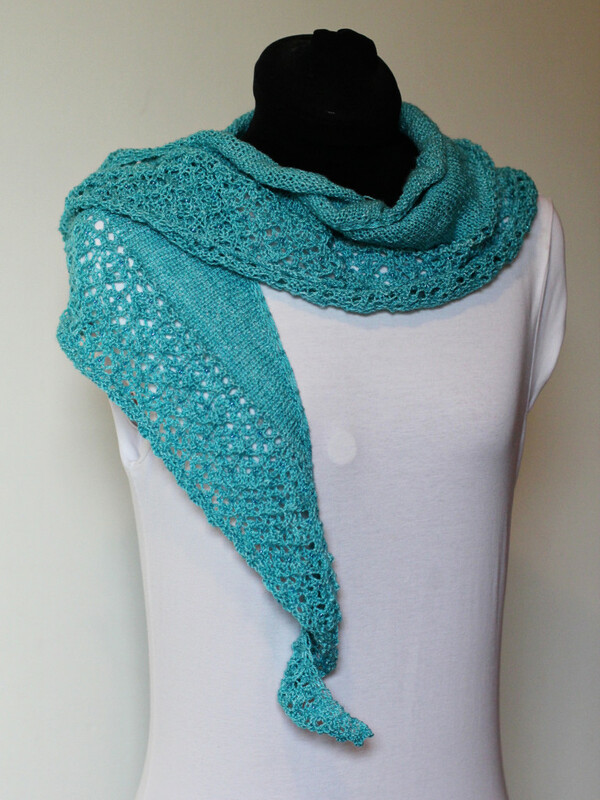 The construction wasn’t too different from a shawl I had knit by Boo Knits so I was hopeful. Alas, blocking offered no solution. The odd shape leaves an abundance of fabric at the base of the neck which bunches and reduces the depth of the shawl. Given the unusual shape of this shawlette I’m reluctant to gift the finished object. I’m happy enough however to acquire such a fabulous neutral accessory. I’ve been experimenting with different way’s of wearing it and thanks in large part to the lovely softness of the Tosh Merino light after blocking, it seems to work really well as a neck warming scarf tucked into a fall jacket. I do think the beauty of this fabric deserves another chance. I’m thinking of knitting another but changing the construction. What if I cast on the same number of stitches that one ends up with, but knit short rows increasing one column of pattern stitches at a time? Might I end up with more of a crescent? Oh for more time in the day! I continue to be a little obsessed with color work accessories. I have a feeling more than a few friends and relations are going to receive multi-colored hats or mittens for Christmas. I was so happy with the Pixie Farts pattern that I recently finished that I looked at other patterns by Barbara Gregory for a second project. 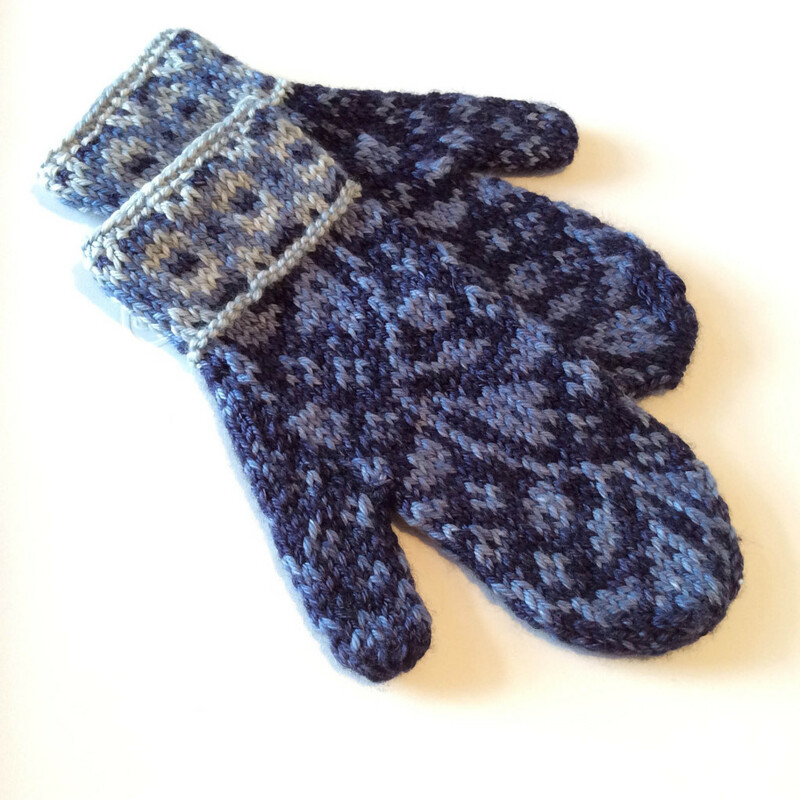 I recently finished these Aldershot mittens knit in Madelinetosh DK. These were a much quicker knit given the larger gauge. I finished them in just over a week. The pattern called for a worsted weight yarn but Knitty City had these three skeins of coordinating yarn in Tosh DK in stock that I thought were a perfect combination. The intended recipient has small hands so I decided to substitute the yarn and knit at a slightly tighter gauge in hopes of a better fit. They are cetainly smaller –perhaps too small— but they fit me almost perfectly :-)! I did have a little trouble making a neat and tidy cuff. 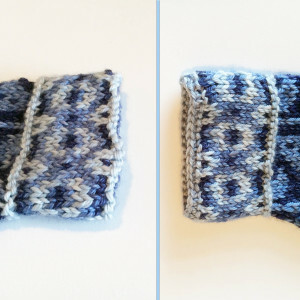 There are garter bumps where the cuff lining turns under and creates a facing for the patterned cuff. I just wasn’t happy with how messy mine looked and so I tidied it up with a little single crochet edging. I think it was a reasonably successful save. The project used less than half of the skein of the darkest blue. I’d like to make the matching hat, perhaps knit with needles one size larger to ensure it fits a normal sized head. Otherwise, my daughter may end up with the matching hat and mits that were intended for her grandmother and they don’t go with her winter coat at all. 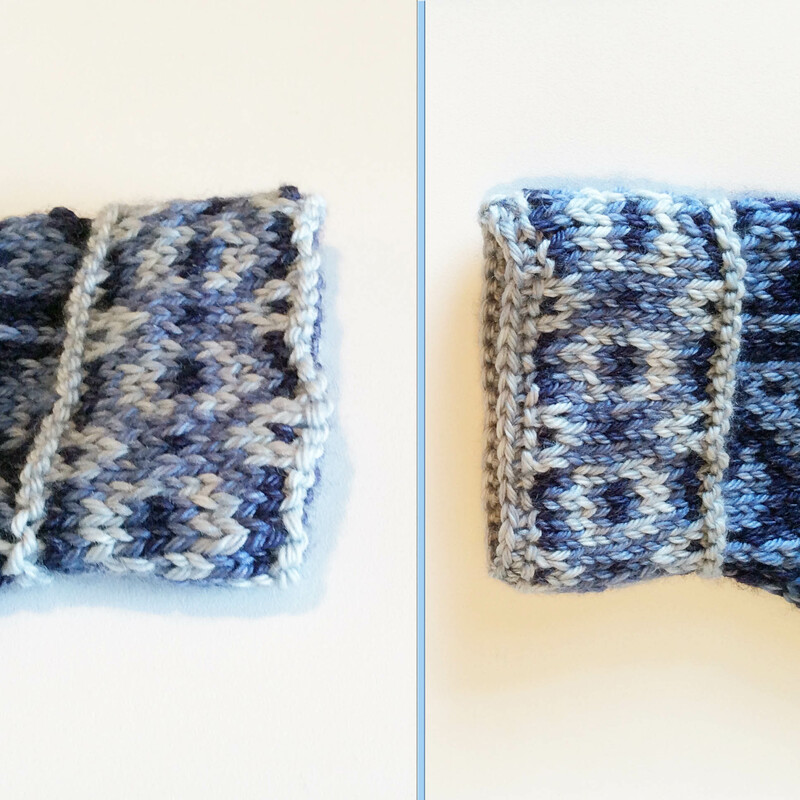 With the Aldershot mittens complete, and worry about enough yardage for the matching hat looming, the release of the Fall 2015 issue of Twist Collective early this week was a perfectly timed distraction. 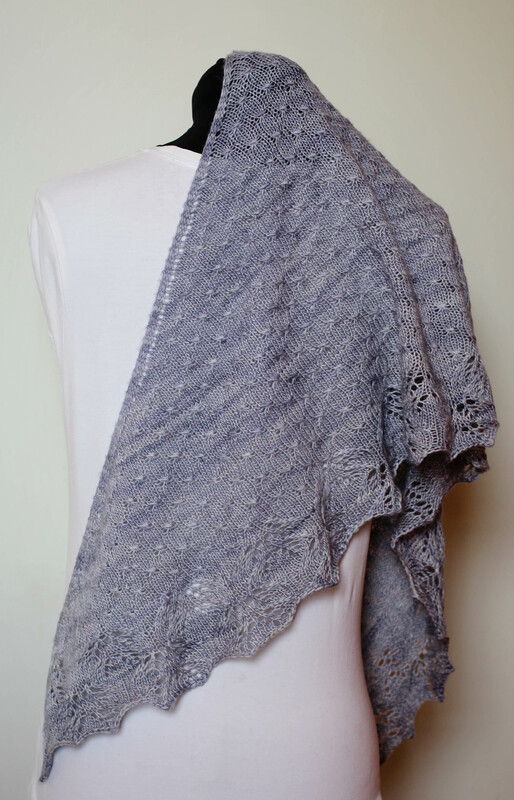 Sure enough there are two knit-worthy patterns by Barbara Gregory in the issue: Filigrene and Sweetfern. I especially love the way the variegated contrast color in Sweetfern works up with the light colored, solid background. This use of a highly variegated yarn was on my mind yesterday when while on a little artisanal ice cream tour on the lower east side I discovered Downtown Yarns. I can’t wait to see how these jewel tones work in Gregory’s inspiring pattern. Our kitten Mochi looks a little skeptical. Mochi thinks maybe I might be a little ambitious. It happens every year right around this time. School’s out, the weather is lovely, wool is on sale, and my imagination turns to how we might best enjoy the holidays. The Christmas holidays that is. I’ll explain. Each summer my family spends a week or so on Martha’s Vineyard with my husband’s parents and as many of his siblings and in-laws as possible. We’re very fortunate to be able to reunite with family in such a beautiful place and with the superb and gracious hospitality that his parents extend. 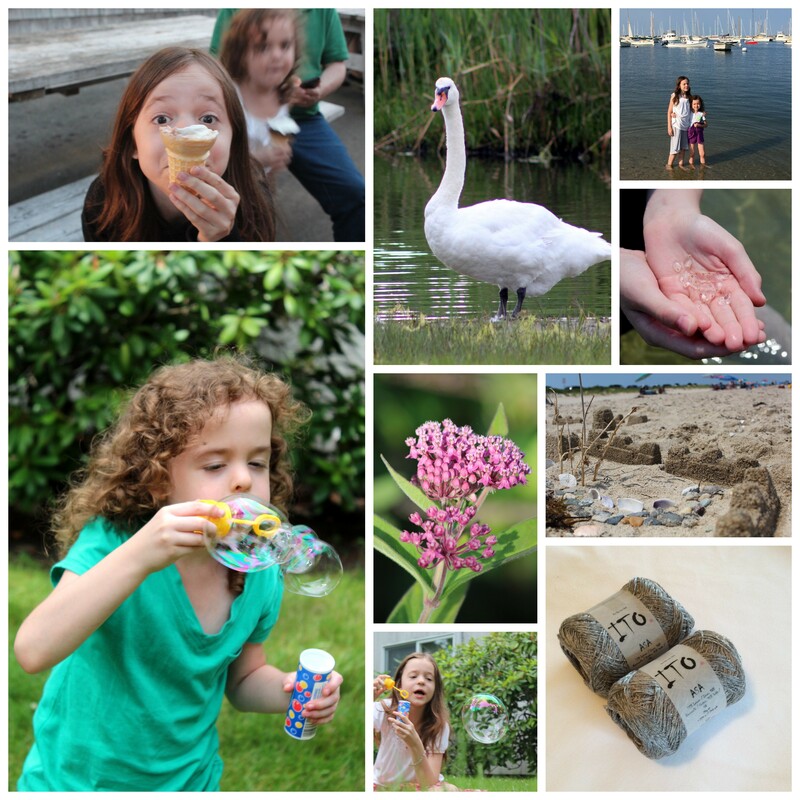 Here’s a fun collage that captures some of the fun and sun we had this year. I found it at a yarn store in Vineyard Haven called Vineyard Knit Works which only coincidentally shares a name similar to this blog. Alas, I was in and out with barely enough time to browse their stock but it certainly seemed worthy of another visit. Next year! 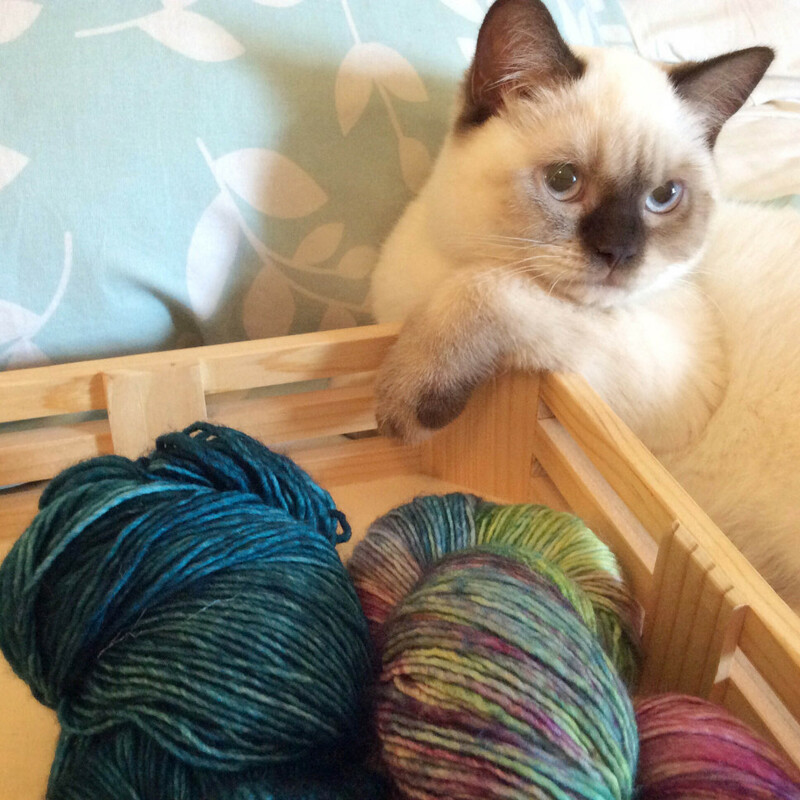 I do get distracted by yarn! You too? Tell me about it ! Seriously – leave me a story in the comments. It’s good to know I’m not alone. Back to the point: Christmas knitting — because after all, it’s July already! Each year as we make the long drive back to New York, it’s always a little sad to reflect on how long it will be before we have a chance to see family again. Perhaps we’ll see them at Thanksgiving, but it may be Christmas before we have another chance. And thinking of Christmas, means thinking of gifts, which means thinking of knitting, and then — *BAM* —suddenly the sadness gives way to the obsessive hunt for the perfect projects and companion yarns for all the potential recipients. I can spend hours crafting elaborate spreadsheets refining my plans for thoughtfully planned and lovingly handmade giving. Well my intentions are in the right place. Alas, my husband reminds me that not everyone appreciates the homemade (imagine that ) and time dictates that I edit my ambitions. 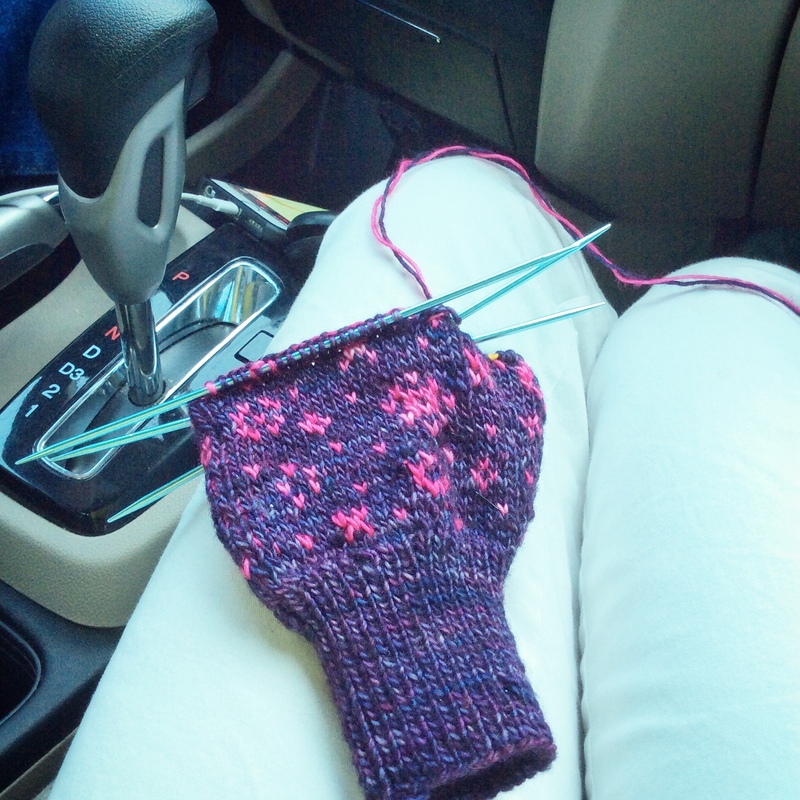 Still, there will be some hand-knits to wrap come the holidays and after many years thinking about Christmas as we drive along the Merit Parkway in the middle of July that I’ve learned to pack an appropriate project to work on to be sure of that. These were begun with optimism late last year and abandoned when it was clear they would be too small for the intended recipient. My eldest daughter has however, admired them and though I may have to send them for a tumble in the dryer to see if I can shrink them a bit, I think she’ll like them. As much as I love the colours and the subtle variegations I’m not convinced the Tosh Merino Light yarn I used was the right choice for this project. 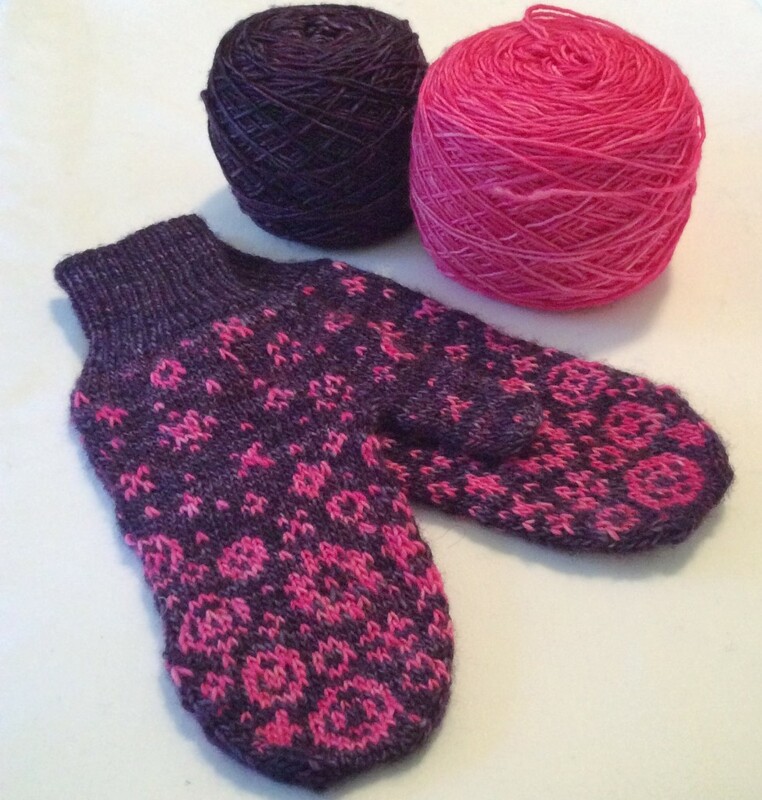 I think my next pair of stranded mittens will be in a plied yarn with a tighter twist. Most importantly, they were a tremendous learning experience. I’ve never done such ambitious color work and though my technique clearly needs more practice, I think at least a couple people on my gift list will find Gregory designed mittens under the tree. Now, how can it possibly be that this designer doesn’t have a fan group established on Ravelry? I confess I’m one of those people whose knitting ambitions far exceed the number of available hours in the day. 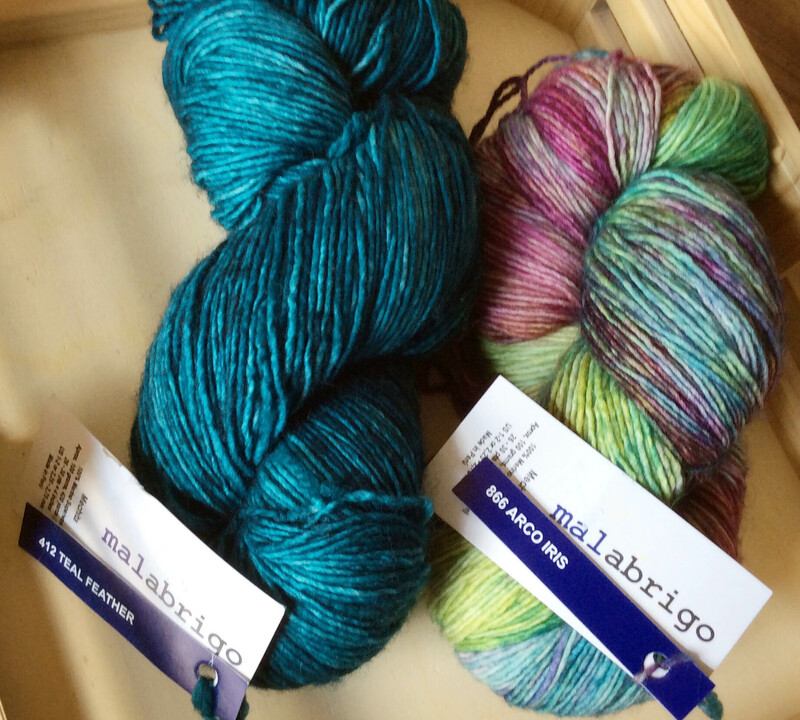 I’m also too easily pulled by the promise of a few skeins of gorgeous hand dyed yarn . As a result I’ve often got several projects on my needles at the same time. 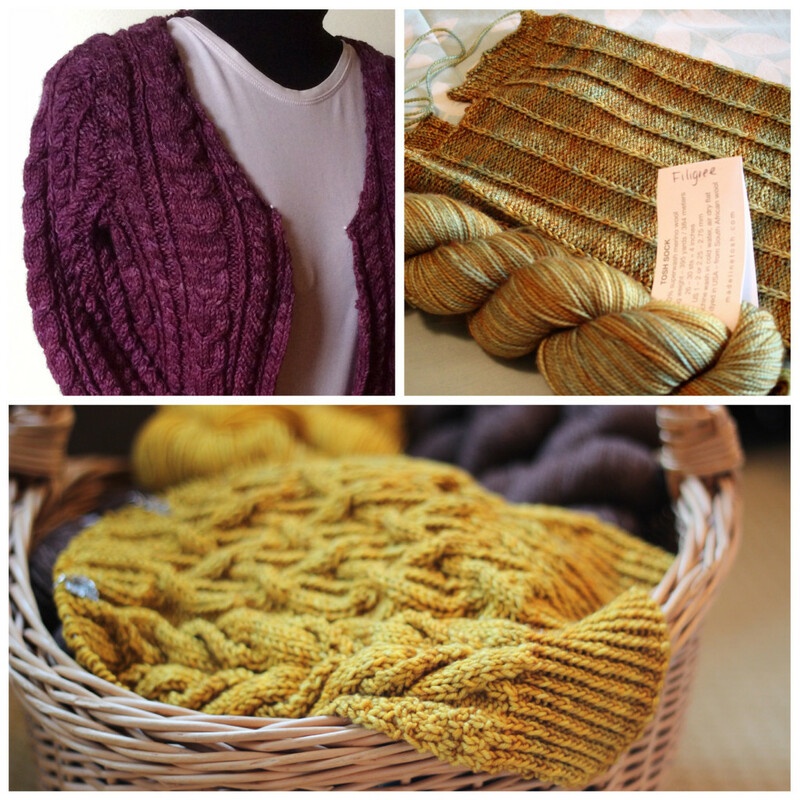 There’s a pretty nice range of projects on the go: each uses a different yarn weight, there are a couple of pullovers and a cardigan, and the styles range from casual to more tailored. At the same time they share a couple of things in common. Most obvious of these is that each of these three projects are being knit in a Madeleinetosh yarn: Grandpa Cardigan in DK Twist, Tuck in Tosh Sock, and Beatnik in Vintage. While there isn’t a Tosh yarn base that I haven’t loved, it’s the colour that always pulls me in. I’m especially fond of the glazed solids with their subtle variegation’s that add a richness to the knitted textile fabric that seems I’ve only ever seen with hand-dyed yarns, and which to me are one of the subtle and very elegant distinctions of a beautifully hand-knit garment. 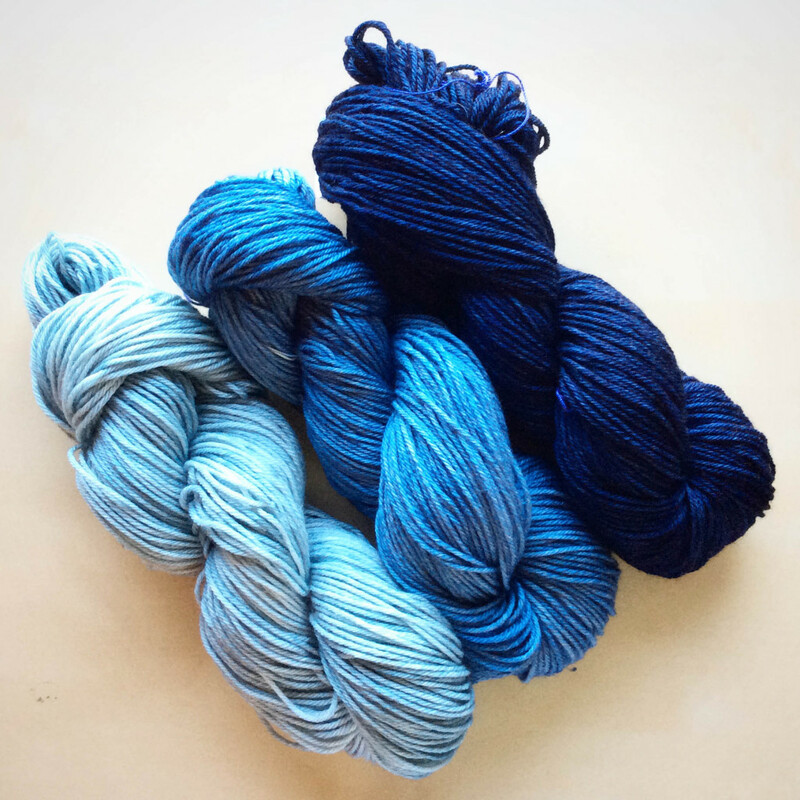 Madeleinetosh offers so many enviable colourways that I couldn’t choose without the help of serendipity. Knitty City, one of my favorite NYC yarn stores, just happens to be a hop, skip, and a jump from my daughters’ pediatrician and my hair stylist. While this is dangerous for my pocket book it is most advantageous for a little creative inspiration. Their Madeleinetosh stock must move quickly because they seldom have a sweater’s worth of a single colour but on a few occasions I’ve lucked out and found enough yarn in a single, to-die for colourway to make myself a sweater. The Vintage in Candlewick and Tosh Sock in Filigree I’ve currently got on my needles are two such hauls. Given the enormous distribution and popularity of Madeleinetosh yarn it’s clear that the founder and owner Amy Hendrix must be at the helm of a substantial enterprise. Nevertheless, the company has the feel of a small, woman-led, artisanal operation and that’s just the kind of business I’d like my retail therapy to support. I confess I’m a little slow when it comes to pop culture…. but this is something else! Apparently, back in 2013, 1. 3 million viewers in Norway (that’s about a quarter of the population) tuned into a 13 hour program that chronicles in more or less real time the knitting process, a program that was part of a broadcast movement called Slow TV. The idea brings to mind something of the slow films of Andy Warhol or As Slow as Possible by John Cage though this television movement has apparently tapped into the popular zeitgeist (at least in Norway) while the Warhol and Cage projects perhaps remain a bit conceptual even granting their sensory pleasures. You can watch a bit of the regular program that spun off from the original marathon broadcast here. Some years ago I enjoyed the company of other knitters in a couple of knit circles. Alas, both groups have since dispersed. Since then, I sometimes binge watch a television program while I’m knitting in the evening. Maybe Slow Knit TV is the best of both worlds. When I was younger I was very lucky to have friends that liked to sail and memories of sun and wind burn on Lake Ontario are still among my fondest. To this day, when I hear a knitter say that they are ready to cast off, it takes me a short moment to realize that they have completed a knitting a project rather than commencing one. So, as I neared the end of the knit work on a shawl that’s been my recent obsession, it seemed a as good a day as any for casting off. So here I am launching Knitworking.net into a sea of knitting blogs with a celebration of a much anticipated cast off of another sort. But unlike our friends and loved ones (well most of them), it responds well to a little aggressive treatment — in this case blocking. One of the things I find endlessly amazing with lace knitting is the magical transformation that happens in the blocking process. 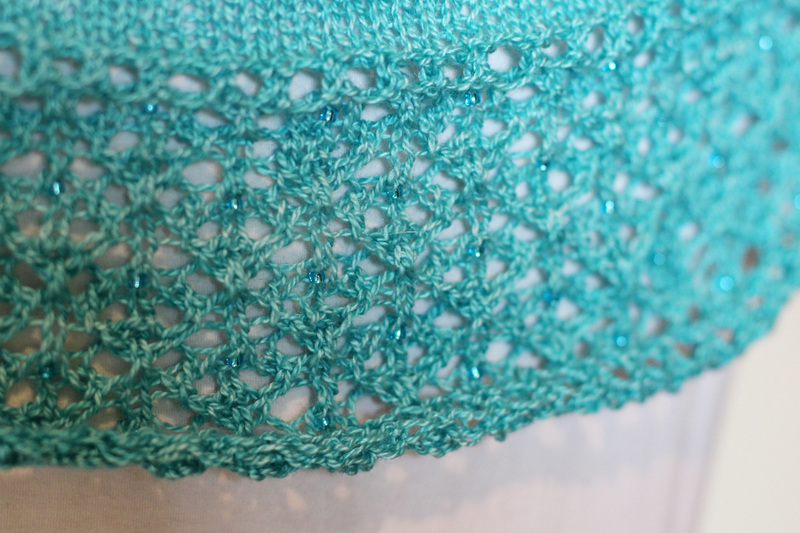 Here’s a fun comparison of the lace section before and after blocking. I call it All I Want. Who can resist a Joni Mitchell song, from the album Blue appropriately enough, and especially one that references knitting! Hear it here. 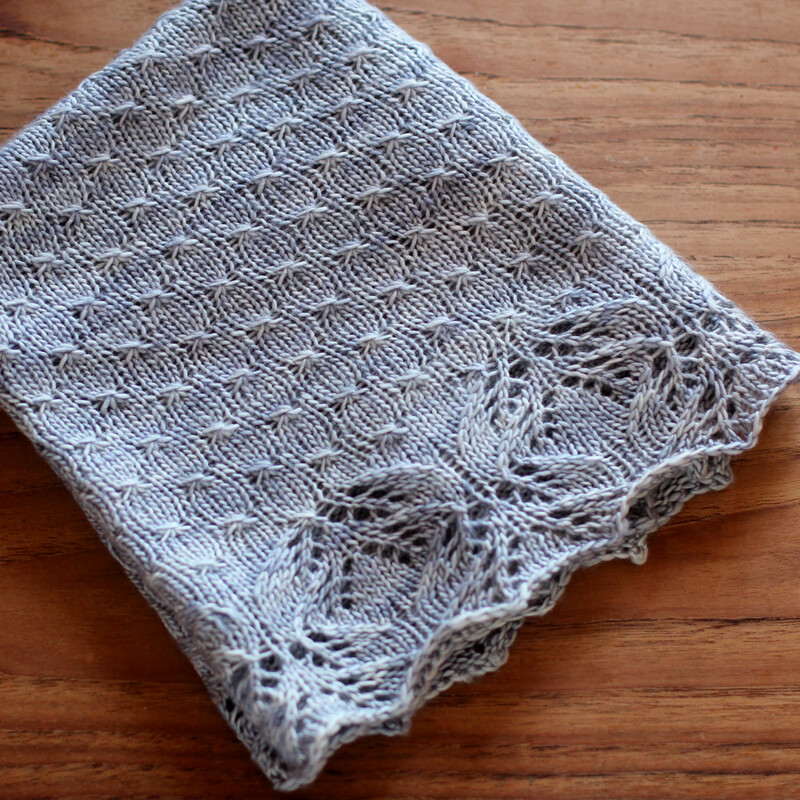 The pattern in Love in a Mist by an incredibly talented woman who publishes her patterns under the name Boo Knits. If you don’t already know her designs, you need to check them out here. I’m drawn to the less elaborate designs myself which lend themselves better to subway knitting and a life-style that gets more mileage from simpler, more minimal styles. Boo Knits claims her motto is “maxium impact and minimum stress” and that her projects are quick and easy to make. I can’t speak for all of them but this is my third Boo pattern and each of these has been true to her aim. Having said all that here is a fair warning: casting off this shawl, with it’s beautiful little picot edge, is, unlike the relative ease of launching a blog, a monumental task! I cannot say enough about how absolutely amazing the yarn that I used for the project. It’s a merino-silk lace weight by one of my very favorite indie dyers — Sweetgeorgia Yarns. Sweetgeorgia earns extra points in my book for being Canadian — I’m just a little less homesick when I’m knitting with Canadian yarn. 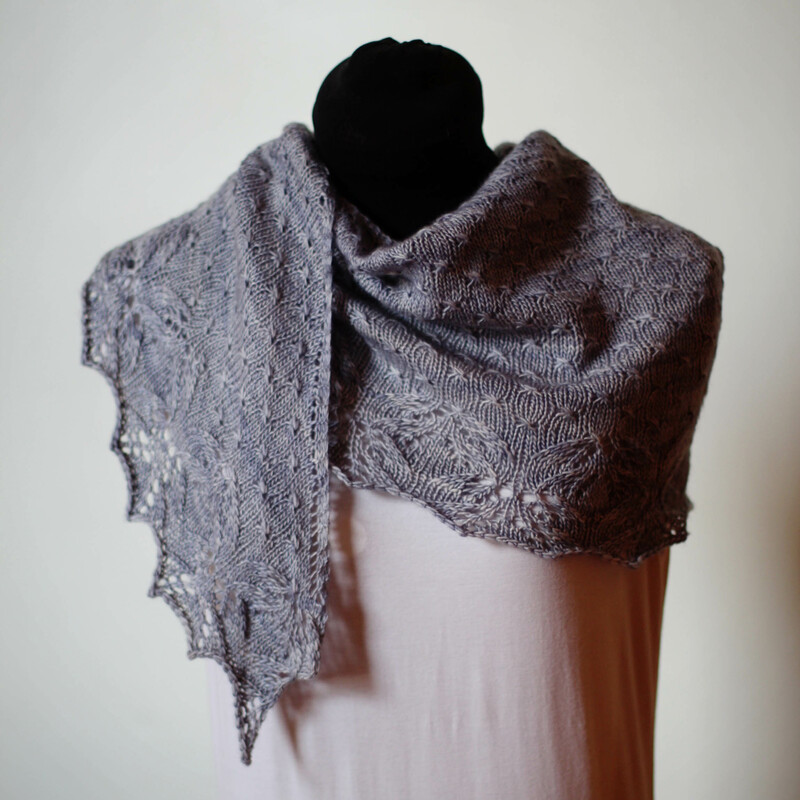 The base is beautiful to knit with — so soft, beautiful drape and perfectly plied — and the colour! I’d love to hear from you about which are your favourites and why. Leave me a note in the comments below. 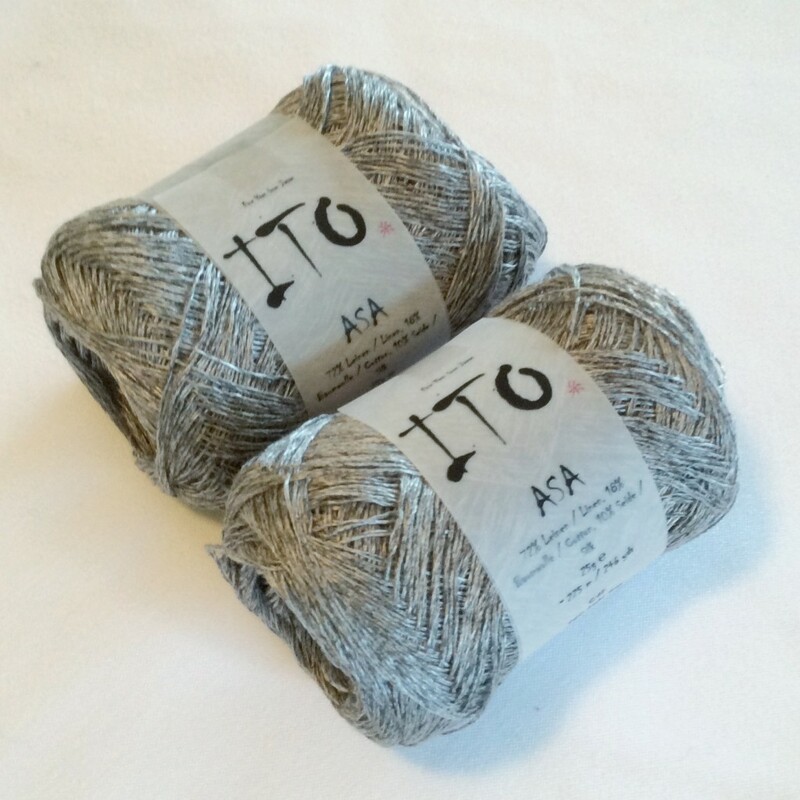 Do you have a project knit with SweetGeorgia Merino-Silk Lace, or a Love in a Mist project to share? Post it on instagram and mention @Knitworking. I’d love to check it out.